Films, footpaths and free events! Studio Egret West and Carl Turner Architects have been appointed by the Council to develop a masterplan for the town centre. 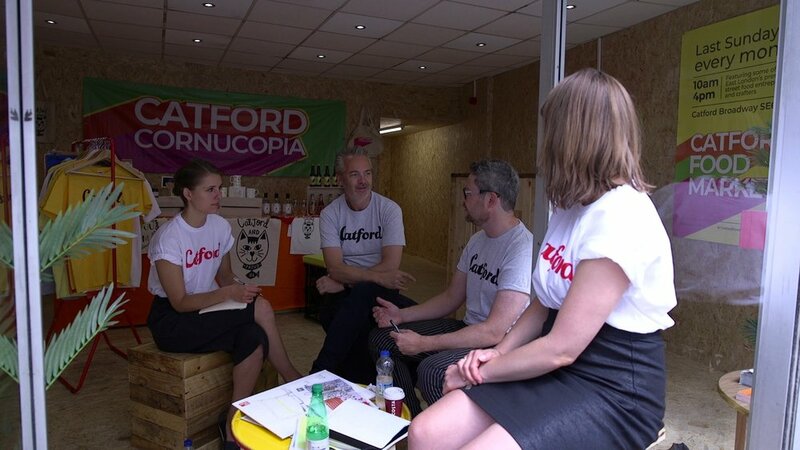 Throughout autumn, their team will work alongside Team Catford sharing their ideas and seeking input from the local community. The Council has tasked the team with developing a creative vision for how strategic sites across the town centre could help deliver new homes, shops, pedestrian-friendly areas, open spaces and community facilities over the next 10 to 15 years. Find out more about the masterplan here and look out for even more dates to be added to our upcoming events. The Thomas Lane car park is often used by pedestrians as a short cut between the Catford Shopping Centre and the Catford Broadway. We have painted butterflies, greyhounds and wildlife in the underpass and along the bridge so isn’t it about time we showed this informal footpath a little bit of love? With permission to allocate a car-free area, the architect team propose to brighten up this route by pruning overgrown shrubs, clearing litter and more than a generous splash of paint. There’s colourful things in store for this part of town. Come and find out more at 17 Catford Broadway this Sunday. Saturday saw the return of open-air cinema to Catford with a free screening of Black Panther. During the day, we hosted a kids craft fair in a vacant unit in the Catford Shopping Centre giving local children an opportunity to get creative. The free event, called Catwanda Forever took inspiration from the fictional country Wakanda, home of the Black Panther in the Marvel universe. Black Panther-themed activities saw local tech guru David Morley, showing budding techies how to code, Ian Wiley helping children create a new currency for Catford and artist, Charlotte Gainey from Catford arts collective, 6arts, helping children design their dream town centre. Local traders, including Eve, showcased original and ethical African fashion, accessories and homeware. The Catford Free Film Festival is back for its third year with a bumper line up of films at venues across town. No tickets required, it’s first come first served so get there early!